(Newser) – Avast, ye mateys! 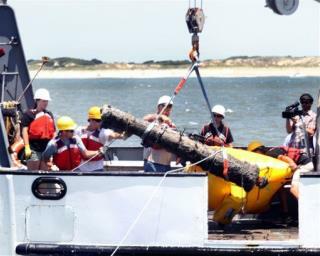 More bounty from famed pirate Blackbeard's ship, the Queen Anne's Revenge, has been plundered, with archaeologists hauling another five cannons from the wreckage off North Carolina's coast on Monday, reports Popular Science. "This is a red letter day. Five cannons is the most we have ever picked up in a single day," says one of the scientists, per the Cartaret County New-Times. The original pirate book a must read is the true story of William Dampier. You won't put it down and it is a true story. And you say who is he? Well now the voyage begins. i say to thee PARLAY! If a Pirate I Must Be...: The True Story of "Black Bart," King of the Caribbean Pirates by Richard Sanders I found this to be a fascinating book of a true Pirate leader that had no choice but to become a Pirate. It is not a novel, it is non fiction. This book really explains why many had no choice but to become Pirates, and they did have a semblance of an ethical moral code of conduct. Good read for several of those cold inclement days now coming your way.